The Angled CPU Stand from Kantek tilts your CPU to an ergonomic angle (5 positions available). The mount for the CPU stand is adjustable, enough so to be able to Accommodate most CPUs. 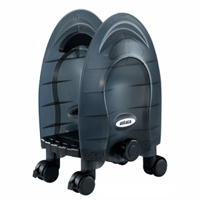 Easy mobility is achieved through the use of swivel casters with brakes. 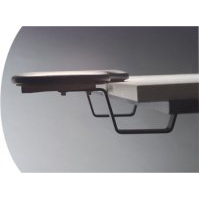 The Retractable Mousing Platform can be attached directly to the underside of a desktop surface or between a keyboard arm and tray. The mousing surface can easily be stored out of the way when not in use. 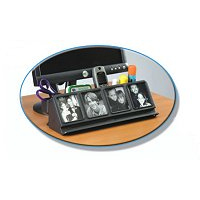 The platform requires a mounting area of 19" x 10.25" and offers an 8.5" x 8.5" usable mousing/writing surface. When used with a keyboard tray (20" width maximum) and arm, the writing platform can be pulled out on the left or right hand side. An integrated safety stop ensures that the working surface cannot be accidentally overextended. The unit is composed of a black metal mounting bracket with a black vinyl-coated MDF board. 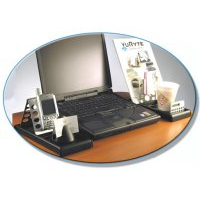 Perfect for the home or office setting - reduce muscle activity in the neck and shoulders. Decreases static strain, fatigue, discomfort, and pain. Increases blood flow to neck, shoulders & wrists. European Styling and Craftsmanship - easy installation - no tools needed. Fits .75" to 1.5" desk thickness. Note: This product has been discontinued by the manufacturer. No 30-Day Customer Satisfaction Guarantee. No warranty. 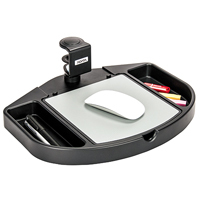 The Under Desk Storage Organizer from Aidata is an economical desk accessory that provides storage space for basic office essentials. 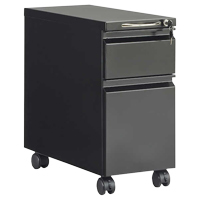 This Storage Organizer can be clamped to surfaces up to 40 mm thick, making it well-suited for use with sit-stand desks that have forfeited traditional storage drawers. 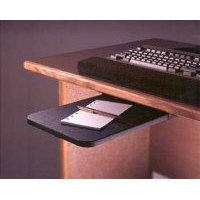 Because it is attached directly to the surface it raises and lowers with the desk, always remaining within reach for quick access. It even includes a removable square 7.5" mousing surface should it be required. 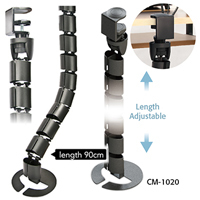 The clamp mount permits a full 360° rotation that permits the storage organizer to be stored by pivoting below the surface in either direction. 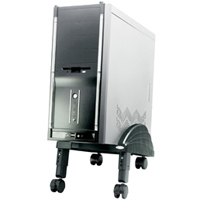 The portable clamp-on design also makes this suitable for temporary workstations where no other storage option is available and for use in combination with the Desk Clamp Keyboard Tray.